Perfect printed invitations start here! Cards Made Easy print invites for a vast range of UK companies for a surprisingly low price. Speak to us about our FREE art-working assistance to get the most from your invite design. 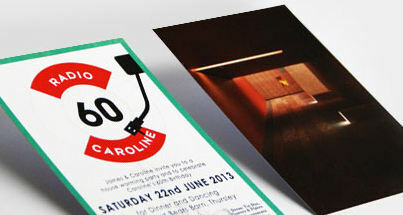 If you are looking for a next day invitation printing service and are based in London, give our expert team a call. We also offer a range of superior papers and card for printing your invitations. The Importance of Printed Invitations. Printing postcard invitations for events and parties is a great way to ensure your guests take notice and put you in their calendars'. A traditional printed invitation conveys the importance of the receiver's attendance for the hosts, and adds a touch of sophistication and formality. So many events use social media to send invitations to their guest list, but it feels impersonal and reduces the likelihood of an RSVP. Whilst the protocol of sending printed invitations is traditional, it doesn't mean that the design and layout of the invite should be! With this in mind we recommend that you use colour palettes, typography and imagery that fits in with the type of occasion. 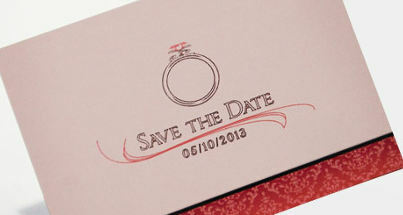 The level of formality associated with the event should dictate the style you adopt for the invitation. Wedding invitations and funeral celebrations have their own rules and etiquette, but for anniversaries, milestone birthdays and key points in life's journey, you have the freedom to design an invitation that fits in with the person or persons whose party it is. Most Common of all is Wedding Invites. It could be said, the most important invite you will ever send is your wedding invitation. The importance of this special occasion dictates that the style, layout and finish of this piece must perfectly compliment the theme of your wedding. Your invite could serve as the initial announcement of your intention to wed, and many people will use them as a keepsake of this fantastic time in your life.